You won't need flowers in your hair – just a true-blue enthusiasm for Zinfandel – to fit right in with the thousands of other wine lovers who will be flocking to San Francisco to attend the 2014 ZAP (Zinfandel Advocates & Producers) TERROIR TASTING, co-sponsored by LoCA… that is, The Wines of Lodi, California. This event takes place next week Saturday, January 25, 2014 (10 AM to 6 PM), in the Observation Post of The Presidio (211 Lincoln Blvd.). Tickets are $70/person ($60 for ZAP members); and you can find further details on the TERROIR TASTING page of ZAP's Web site. At the TERROIR TASTING, zin enthusiasts will be able to take an exhilarating vinous journey, without leaving the room, through all of California's major Zinfandel growing regions; including Lodi, Napa Valley, Sonoma County, the Sierra Foothills, Mendocino County and Paso Robles. In addition, there will be tasting-workshops led by some of the state's top sommeliers, moderated by Lodi's own Randy Caparoso. For further details on these sommelier guided tours, please visit ZAP's Sommelier Workshops page. Why the emphasis on terroir? Lodi is a huge supporter of this concept precisely because sensory "sense of place" has only recently begun to be associated with Zinfandels grown in Lodi. Sure, for the longest time Lodi has been growing more Zinfandel than any other region in California, crushing over 40% of the state's yearly crop. But the idea of producing premium quality Lodi Zinfandel is a fairly recent one: Lodi's old vine plantings, Mediterranean climate and deep, sandy loam soils take a back seat to no other region, and it's just been a matter of showcasing these riches, particularly in single-vineyard bottlings. Exactly what do we mean by terroir, and why should it matter to a Zinfandel lover? For more and more consumers just beginning to refine their tastes in wine, expression of terroir has become just as important, or more, than "varietal character" when it comes to judging the quality of a red wine like Zinfandel. It is true that "terroir" has become one of those wine terms that most people, even many wine professionals and so-called "experts," have trouble distinguishing in the actual taste of wines; and so the most convenient thing for many of them to do has been to deny that terroir related distinctions exist, or that they matter. Especially when it comes to wines like Zinfandel, which often taste so strongly of the grape that sensations derived from geographic origins become neither here nor there. But is this being fair to the grape? For many wine lovers, Zinfandel makes just as noble a varietal as Cabernet Sauvignon, Pinot Noir, or any other variety of Vitis vinifera. That terroir is part and parcel of wines from France, for instance, is never questioned by the cognoscente. Fine French wines – the sort qualifying for specific appellation d'origine labels (rather than mass production ordinaire) – invariably have a very strong "sense of place," which is essentially what terroir means: sensory qualities, including aromas and flavors, that are direct reflections of where a wine is grown; involving factors such as a vineyard's soil and topography, climatic conditions, the grapes utilized, and even all the human factors (such as viticultural and winemaking traditions) associated with a given place of origin. The problem with ignoring terroir and appreciating Zinfandel only in terms of a generalized sense of varietal character is that this approach is an affront to what truly makes wine special: something that is grown and then crafted, not manufactured or churned out in large scaled, monotonous droves. When we relegate the Zinfandel to narrow conceptions of varietal fruit qualities, we are placing more value on how well a wine ascribes to preconceived notions of "Zinfandel," rather than how well it represents the unique place where it is grown. Case in point: the pioneer of modern day Zinfandel is Ridge Vineyards, who have been producing single-vineyard wines from the grape since the early sixties. Some time ago, Ridge stopped putting “Zinfandel” on their labels — what you see instead are place names, like Benito Dusi Vineyard in Paso Robles, and Lytton Springs and Geyserville in Sonoma County. This is partly because Ridge’s vineyards are traditional fields blends, where Zinfandel predominates. But mostly it is because they are saying they no longer produce wines that are supposed to taste like Zinfandel; but rather, wines that taste like Benito Dusi, Lytton Springs or Geyserville. Even more telling: during the past twenty years California's most prestigious producer of Zinfandel has probably been Turley Wine Cellars. Turley is based in Napa Valley, where they source magnificent single-vineyard Zinfandels; but they also grow and produce Zinfandels from Sonoma County, Lodi, Amador County, Contra Costa County, and Paso Robles. If you ask the owner, Larry Turley – or his head winemaker/grower Tegan Passlacqua – which are their best Zinfandels, they'll tell you, "all of them." Not because they think they make the best Zinfandel, but because they know that their best Napa Valley Zinfandels are grown in Napa Valley, and their best Lodi Zinfandels are grown in Lodi. They'll also tell you that the steep limestone hillsides of Paso Robles produces Zinfandels with their own unique, haunting beauty; and the same thing about the Turley Zinfandels from their +100-year old vines in Contra Costa, Amador County, and Sonoma County. Turley, in other words, crafts wines to capture qualities of terroir, not just grapes. They aren't going for sny specific "varietal" conception of Zinfandel – otherwise all their Zinfandels would end up tasting the same, which would defeat the purpose of sourcing from so many different places. Nor are they concerned by how well any of their Zinfandels measure up in terms of arbitrarily defined 100-point scores, which would also defeat the purpose. 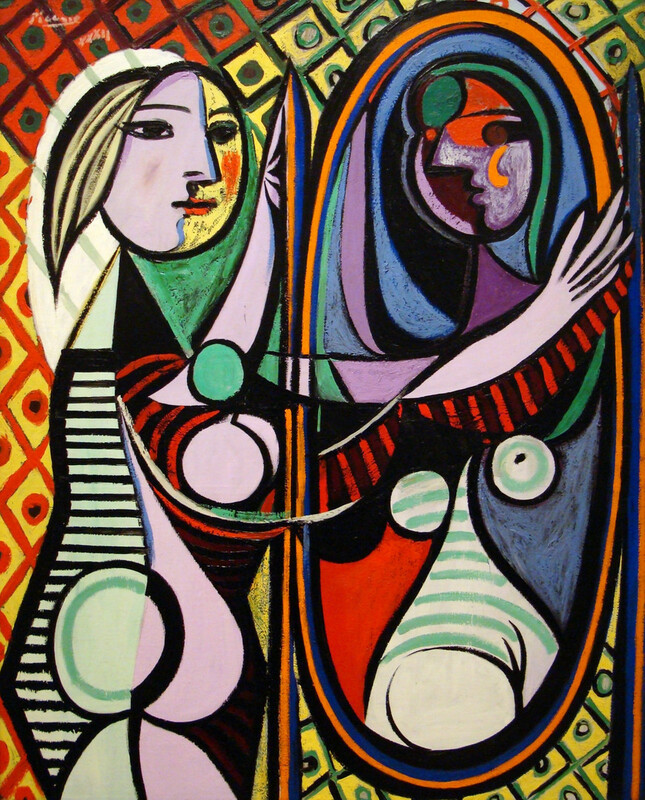 Was Picasso going for a 95 with his “Girl Before a Mirror,” and 100 with his “Seated Woman?” Of course not. All of his paintings were organic inspirations of specific times, places, states of mind – each unto its own – just like every great Zinfandel is an organic outgrowth of a place, a vintage, and a winegrower’s state of mind or disposition… sometimes demure or daunting, and often ravishly rambunctious! Vignerons like Turley and Ridge do this because they love the diversity of Zinfandel, and their loyal followers have been eating this up. Naturally, more and more consumers have also been coming around to this idea: that you rate, or appreciate, a Zinfandel by how well it represents where it is grown, not by how much it tastes like Zinfandel as a "varietal." Finally, there is the fact that in Lodi, like elsewhere in California, the finest Zinfandels invariably come from the oldest vineyards, planted as long ago as the nineteenth century. Vines that were planted over 100 years ago don't survive unless they have been very, very well loved, and highly valued. You don't even have to know how to explain what makes them special when you taste them in a glass to appreciate their significance. The Lucas' Zinstar, m2's Soucie, Macchia's Noma, McCay's Trulux, Klinker Brick's Marisa, Harney Lane's Lizzy James: these and other Lodi Zinfandels coming from vines planted before most of us were born are special precisely because of lineage. It doesn't make sense to judge them on the basis of how well they compare to Zinfandels from, say, Turley's Napa Valley plantings. Turley wouldn't – why should you? Individual ancient vine Zinfandel growths deserve a lot more respect than that. They are special because they are like none other – not because they produce a Zinfandel that tastes like other Zinfandels. This is what terroir is all about. As usual, the choices of Zinfandels to taste at next week's 2014 ZAP events will run in the hundreds. Our advisory: don't worry so much about making sensory distinctions; and for Pete's sake, don't bother looking for "varietal character." Just enjoy each finely crafted Zinfandel for what it is: something grown by hard working people who love this great American wine tradition so much, they are living and breathing it!